​This Christmas we invite you to come alongside us as domestic missionaries, ministering to children right here in America who have been abused, abandoned, and exploited. Your donations will help alter their future, allowing them to break the generational cycle of crisis and become healed through the Ultimate power of the Gospel. ​On behalf of all the children at Still Creek who no longer have to wonder what the next day will hold, thank you for your support and prayers. We truly could not do what we do without your help. ​ "Religion that God our Father accepts as pure and faultless is this: to look after orphans and widows in their distress and to keep oneself from being polluted by the world." Below you will find multiple meaningful ways you can get involved in the life-changing ministry of Still Creek. You may either donate for the entire item or "share the cost." Your gift will provide a pair of boots (used daily for horseback riding, school, chores, etc.) for a child in need. Through basketball, volleyball, cross country, and equestrian riding, students learn important character traits such as discipline, responsibility, work ethic, and perseverance. Your gift will help cover the cost of athletic equipment, uniforms,travel, etc. Many of our children come from homes where they did not know if they would get to eat each day, or homes that offered little to no nutritious foods. It is vital to show them how to take care of their body and create healthy habits. Your gift will provide groceries and fresh produce for a family of 8-10 for 1 month. Your gift goes toward providing a child with a quality education, textbooks, technology, intervention tools, and otheritems needed to educate our children. Invest in our children's future by donating to the college/trade school scholarship fund! Your donations will be used to help children who have no family or other support pursue higher education so that they can support themselves, their futurefamilies, and become contributing members of society. of a friend or family member as their Christmas gift. Be sure to request an Honor Card to give to your loved one on Christmas morning! You can also get a t-shirt for your loved one online (all proceeds benefitthe children of Still Creek). *If the item you are donating towards has already been completley provided for, your donations will go towards another item. 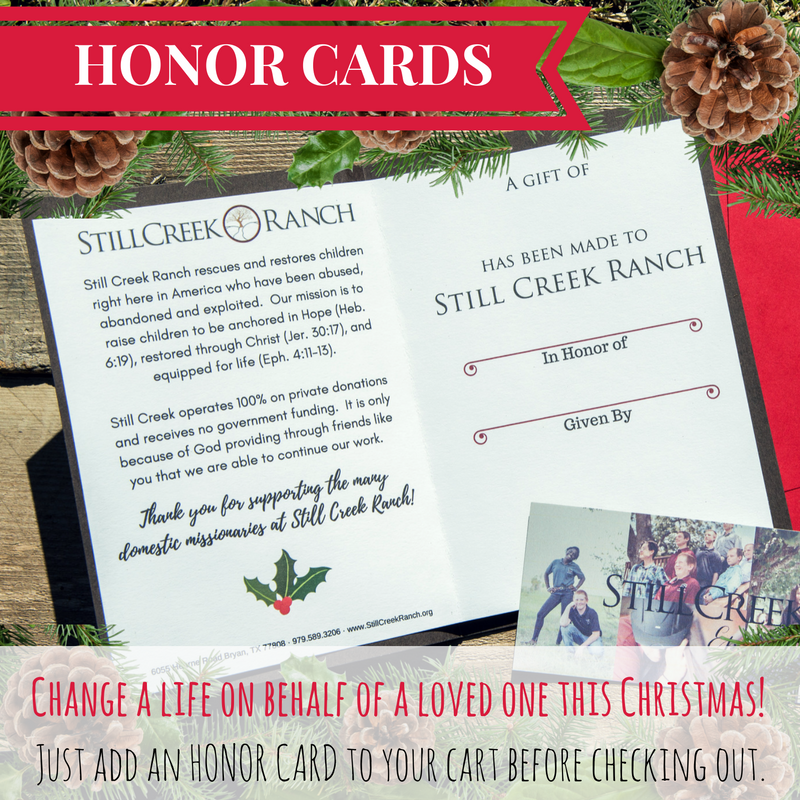 Give your loved one some great Still Creek gear with their honor card on Christmas morning! All purchases are tax deductible and proceeds directly benefit the children of Still Creek.